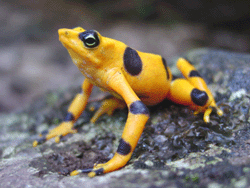 A National Symbol of Panama and Now Extinct in the Wild: The Panamanian Golden Frog. Celebrating 50 years of pioneering research and sharing an inspiring vision for our future, world-renowned primatologist and conservationist Dr. Jane Goodall renews her faith in nature and humanity during the “Gombe 50” anniversary. “When I began in the early 1960s even the global scientific community wasn’t talking about—or really concerned with—conservation and environmentalism. Rainforests stretched across Africa and across the global equatorial belt but now these areas have become ever-decreasing fragments of forest. 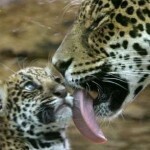 In turn, wild animal populations have suffered. Wild chimps, for example, numbered an estimated one to two million in 1900 and now there are fewer than 300,000 spread across 21 nations. The numbers of wild elephants, tigers, gorillas, rhinos, etc. have all decreased by horrific percentages. The Buzz has started in LA for ecoReserve and micro-conservation. ecoReserve took micro-conservation on the road on April 20, 2010 and showcased the game changing concept at a fabulous house party in Los Angeles. It was an early Earth Day celebration two days in advance. We consider it a 3 day Earth Day celebration and a terrific way to celebrate Earth Day 2010 with supporters of ecoReserve. A generous supporter of ecoReserve offered their home in Los Angeles and hosted a fabulous party for us in their stunning private home. More than 50 guests were in attendance, many from the entertainment industry. So the buzz has started in LA. We can’t wait to get Hollywood’s creative minds thinking about how to tell the stories of what is taking place on the ground in the biodiversity hotspots in which ecoReserve will be working. The excitement is building for micro-conservation and how individuals can make a difference on ecologically significant pieces of land when they acquire their own private nature reserve beginning in Panama. As Sandy mentioned in her post about the SF Green Festival, we’re adding a feature to our initial launch: the ability of ecoReserve users to send gifts to other users. There will be a page on the site with a form that allows users to select a gift amount, and send it to an existing ecoReserve friend, another ecoReserve user, or to someone who hasn’t joined ecoReserve yet. Users will also be able to access this feature while browsing through Reservist profiles. We’re also enhancing our “sharing” capabilities for this feature. Users be able to post the page to Facebook, of course, asking their friends to shower them with ecoReserve gifts for their birthday, wedding, or any other occasion. We’ll also allow users to send out a pre-formatted email inviting them to send gifts for those same occasions. We all appreciate the feedback given to us at the Green Festival. The Gift feature is something that somehow evaded our initial rfeature list, thanks to those who got it back on the list! ecoReserve Does First Trade Show at SF Green Festival! We just finished up a great weekend with ecoReserve doing its first trade show at the SF Green Festival. At Green Festival™, a joint project of Global Exchange and Green America, attendees were celebrating what’s working in our communities—for people, business and the environment. Think of Green Festival™ as a walk through a sustainable community. It begins with finding solutions to help make our lives healthier—socially, economically and environmentally. Individuals along with business and community leaders come together to discuss critical issues that impact us at home and abroad. Organizations and businesses showcase programs and products that restore the planet and all that inhabit it. Neighbor-to-neighbor connections are formed, and skills are shared to empower people to create positive change in the world. We were pleased to have a booth at the nation’s premier sustainability event, where we were a part of the best in green. This included more than 125 renowned authors, leaders and educators; great how-to workshops; cutting-edge films; fun activities for kids; organic beer and wine; delicious vegetarian cuisine and diverse live music along with a unique marketplace of more than 350 eco-friendly businesses—everything from all-natural body care products and organic cotton clothing to Fair Trade gifts and beautiful kitchen tiles made from renewable resources. It was a busy two days with a lot of excitement about the Festival and about us. It was the first time we publicly talked about ecoReserve. We showcased our product that will help to restore the planet and all that inhabit it in the form of nature reserves. We formed neighbor-to-neighbor connections and shared our message about micro-conservation and how it empowers people to create positive change in the world. We had a constant stream of people visiting us in our booth. We shared the concept of micro-conservation and how people could make a difference by adopting their own nature reserve for as little as $25. We were met with a lot of positive responses. Our booth really stood out as unique – it was designed it to look like a living-room size nature reserve, which drew a lot of attention. Our jungle at the Green Festival. Main draws to our booth: 1) the jungle look in general, 2) the creative moss covered computer monitors. We had a slide show of scenes from the reserve, and last but certainly not least, 3) a constant supply of cookies. There were people who said they loved the concept of micro-conservation. We got a lot of people who said they were about to have a birthday and would like to ask their friends to buy them ER parcels. Other people said they had multiple nieces/nephews who would like a reserve as a present. We are building this functionality in our 1st release of the product. Our CTO Jim Lynch will announce it later this week. All in all, it was a wonderful experience for ecoReserve and if the response received at the Green Festival is any indicator of things to come in the future we are excited as we believe that micro-conservation is going to be an exciting new concept in land conservation that people will view as exciting and game-changing. 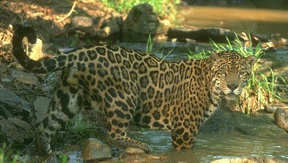 Check out the interesting article about a Jaguar in Panama. 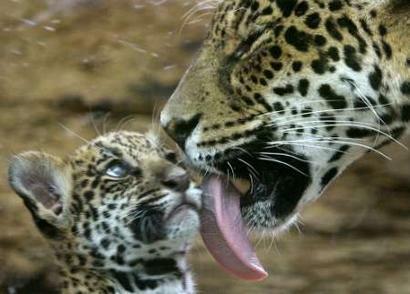 Is it the same jaguar? Guess! ecoReserve is excited to be a part of the San Francisco Green Festival this year and to be unveiling micro-conservation for the first time in a public forum to attendees of the Green Festival. Please join us and be on the leading edge to learn about a new concept called micro-conservation and what you can do as an individual to make a difference in this world to protect ecologically significant land and create sustainable livelihoods for those people in living on the land. Become a micro-conservationist! You can create your own living-room size nature reserve on endangered land for just $25. ecoReserve is a new non-profit that is launching a game-changing model for conservation this spring called grassroots micro-conservation. Your nature reserve will protect rainforests and animal habitats, and help local communities live sustainably. Here’s a preview of what you will be able to do as a micro-conservationist. You can select a parcel on our interactive map that uses the Google Maps API and high resolution aerial imagery to display the available reserves. You will then receive your own private reserve page with annually updated images of their reserve so you can track changes over time. You may visit your reserve whenever you wish. Our scientists will provide ongoing information about the reserve’s restoration, its plants and animals, and its ecosystem services such as carbon sequestration. You can learn about conservation as our site will have educational features such as Posts from the Field with videos, photos, and blogs from the scientists, staff, and local community members. You will have your own personal profile where you can share facts about yourself and upload photos and videos. As a members you can save land as individuals or in a group (such as family, friends, colleges, companies). You can join clubs to connect with people who share similar interests (e.g. sustainable livelihoods club). Our Facebook app and iPhone app will enable individuals to share their reserve easily with their social networks. You can make a difference for generations to come by engaging ecoReserve’s game-changing conservation model. Our mission is to provide a platform that will allow you as an individual to restore and protect endangered land, and support sustainable livelihoods and spawn a new grassroots movement for individual land conservation by providing an engaging online platform for you to create your own private nature reserves around the world and to share that excitement with your friends and have that excitement spread. We are unveiling our concept at the San Francisco Green Festival. The San Francisco Green Festival™, a joint project of Global Exchange and Green America. In 2008, the San Francisco Green Festival™ boasted 3 days filled with the best in green, and continues to expand in size and scope! With more than 150 renowned speakers and 400 green businesses, this event was an amazing success! We expect this years event to be an amazing success again. Come by Booth 1051 at the Green Festival (April 10-11, 2010) and check it out! Share it with your friends, start the movement, make a difference.